Hello, crafty friends~ It’s Eunyoung here. 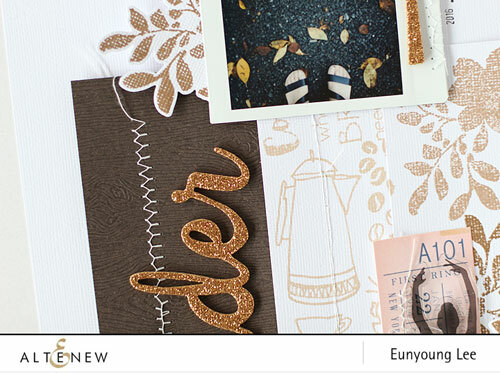 Today I’ll share a layout using brown colors! You maybe know Altenew have a lot of new products in September. They include dye ink pads, papers, stamps and dies. I love the new dye ink pads and I found beautiful colors – espresso, mocha, rockyshore and sand dunes. So today I’ll show you the beautiful colors!! I used three dye ink pads for this layout – Espresso Dye Ink, Mocha Dye Ink, Rocky Shore Dye Ink. And I stamped the images from Coffee Love Stamp Set and Floral Shadow Stamp Set. I used Woodgrain Bark (coffee brown color), because it has wood embossed finish. I love its texture. I stamped the images from Coffee Love Stamp Set with Rocky Shore Dye Ink on a white cardstock. Because I like the texture of cardstock, I ususally use white cardstock for background & stamping. And I used Espresso Dye Ink & Mocha Dye Ink as I stamped Floral Shadow Stamp Set. I trimmed papers (stamped paper & Woodgrain Bark coffee brown color paper) to the size that I want. I did machine stitching on each paper piece. 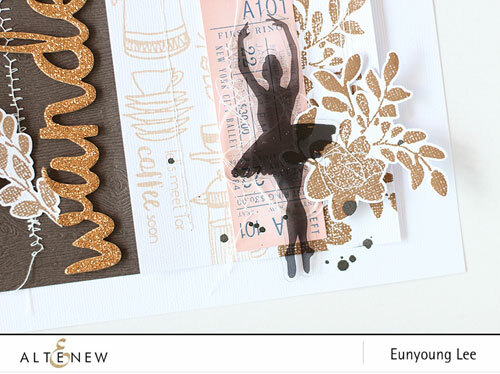 After added them with double side tape, added a title and embellished with die-cuts of Floral Shadow Stamp Set. I didn’t embellish too much on this layout. It’s my finish to splatter a black mist as usual. I hope you enjoy it. Thank you for stopping by. 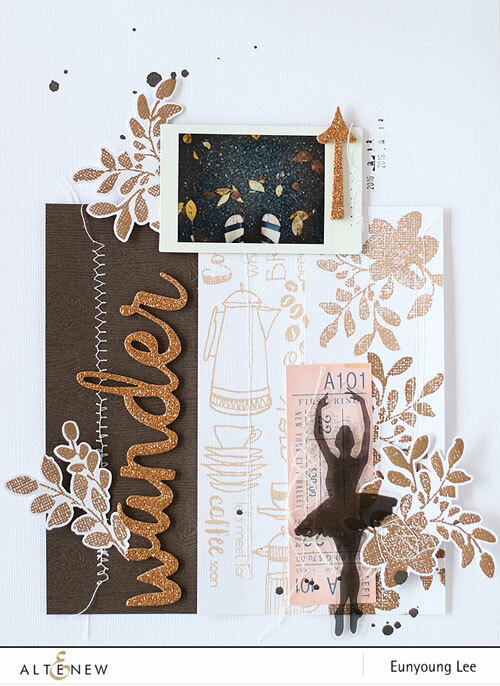 Beautiful design and love the brown tones!